Self. Identity. Who we are determines how we live our life, but what if your gender, or what you are told is your gender, does not in any way feel like your true self? What if you do not identify with the girl or the boy they say you are? How then do you navigate your world? How does the loneliness of feeling not “self” dictate your desires? BOY is based on a true story of a child born a boy, but due to a horrible accident is raised as a girl. The “Boy” at the center of the play is Adam, portrayed so sublimely by Bobby Steggert. 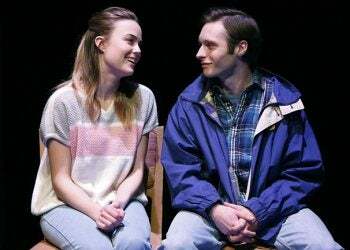 Adam is hoping to have an intimate relationship with Jenny (Rebecca Rittenhouse), but the truth of his past keeps him from being able to have the connection with her he so desires. Adam is trying now as an adult to become the man he could be, while also trying to comfort the boy he should have been. The play spans the early years of Adam’s life as well as his present. As a young child Adam had been seeing a psychiatrist, Dr. Wendell Barnes (Paul Niebanck). This is the 60’s and 70’s and Dr. Barnes believes, as many did at that time, in the “blank slate” theory which says we are all born completely free of any disposition including identifying ourselves as one particular gender. This theory allows Dr. Barnes and Adam’s parents (Ted Koch and Heidi Armbruster) to believe that all they need to do is convince the boy that he’s a girl and all will be well. But we know now that we are not blank slates and that gender is something we identify with immediately. We know who and what we are even as children. So instead of letting the child decide how to live, the adults take it upon themselves to tell that child how, where and what, confusing and disrupting completely Adam’s formative years. There are no definitive antagonists here. Everyone is doing what they can to help a child who feels completely out of step with the rest of the world, it’s just that their help is destroying him. Anna Zeigler’s writing is clean, clear, and concise. Not a word out of step. Her poetry of emotions all brought so beautifully to the stage by Linsay Firman’s subtle directorial hand. The cast is simply put – perfect. "In the title role of 'Boy,' the diligent new play by Anna Ziegler that opened on Thursday night at the Clurman Theater at Theater Row, Mr. Steggert is very good at portraying a little girl who wants to be good but is thwarted by the discomfort that comes from being born a boy, a fact of which she (he) is unaware."